The Boston marathon isn’t just a race, it’s an institution. As you probably know, the first Boston marathon was in 1897, that’s right, more than a century ago! I can’t even imagine what kind of shoes they ran with back then. 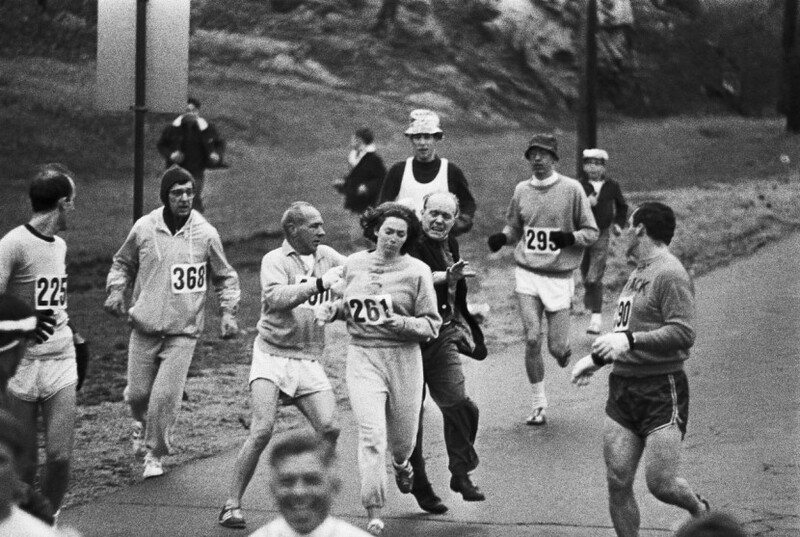 But Catherine Switzer isn’t the only famous female runner of this race. Rosie Ruiz looked great on the final mile of the 1980 Boston marathon, the problem was that she also couldn’t remember things about the run that most runners would know such as intervals and splits. When people asked her what she thought about various things on the course, such as the crowd at Wellesley College, she just didn’t know. Hmmm, that’s suspicious right? About a week after her “win,” Ruiz was stripped of her title. Now, have you ever heard of Heartbreak Hill? While it’s clearly not the most difficult marathon in the world, this course is known for being tough. There is a scary series of four hills, with the last one coming between miles 20 and 21. Yep, this is right at the point where yours truly will probably “hit the wall”. It’s said there’s more “heartbreak” on that hill from lost or uncompleted races than any other spot. I can’t wait! Over 500,000 spectators will be cheering for us this year. If my math is right, that’s 80 percent of Boston’s total population! Guys, I can’t believe that on Monday I’ll be part of the 120th Boston marathon, I will write my little page in this incredible history. I don’t remember how long it took Pheidippides to go from Marathon to Athens, but it should take me about 3 hours and 45 minutes to get to Boylston street on Monday. I will proudly wear the bib #24582, I will start at 11:15 AM in wave #4 corral #1, wish me good luck!